Does the Hulda Clark Zapper really Work? Parasite Zapper Hoax, Scam, or Real? There is the question of the zapper and its disputed effectiveness. Some sites try to debunk the zapper by claiming that there are no peer review studies supporting Dr. Clarks claims about the parasite zapper. They fail to mention that a FDA approved peer reviewed study can cost millions ( up to $800,000,000 US ) of dollars to complete. There has been one published study which shows effectiveness and additionally, the reality is that the zapper is a basic bioelectric resonance device which has genuine value. Using electrical energy to zap cancer cells may sound like a strange idea. But clinical trials at twelve major hospitals around the country are now testing it against the deadliest form of brain cancer. from: http://www.sciencentral.com/articles/view.php3?article_id=218392979 Also, on YouTube: http://www.youtube.com/watch?v=td5Ld3nURAI and http://www.youtube.com/watch?v=rD3Gdkhzj9s. While some of these videos show the use of Plasma fields, this is not the only method of PEF ( Pulsed Electric Field ) transmission. Really, using the zapper is just plain common sense. If a lot of electricity can kill a man, why can not a little parasite be killed with a smaller amount. Consider this, antibiotics are poisons, we only take a small amount of the antibiotic to kill the smaller organisms that are attacking us. Taking a larger dose could kill us. New video on using electricity to kill bacteria in teeth and gums:zapping teeth and gums From U. at Buffalo, NY. Another study on using electricity to kill bacteria in water:kill bacteria in water with electricity From Stanford Univ. While not a study in itself, this article discusses some of the active work using electric pulses to kill microbes, underway. In another study: "researchers also found that increasing the number of pulses per treatment had a greater effect on bacterial reduction than did increasing the strength of the electric field." Paper can be found at http://www.worldscientific.com/doi/abs/10.1142/S2339547814500101. New Breakthrough Study published:Retrospective surgery study of the therapeutic effectiveness of MORA bioresonance therapy with conventional therapy resistant patients suffering from allergies, pain and infection diseases PDF download. In this study, Bioresonance was used and compared with Bioresonance and zapper usage combined on post surgical patients. This study showed significant efficacy of both MORA and using the zapper as an adjunct. A study in 1997, showed that low voltage, low amperage current could be used as an antimicrobial. See: http://www.ncbi.nlm.nih.gov/pubmed/9222036 . The zapper has been proven time and again to kill bacteria, protozoa, and other small parasites in the laboratory. It is better, more powerful, more efficient, and definitely faster than antibiotics in some cases! It does not take a medical degree to see this. It only takes a simple microscope, some grass from the yard, some water, and a zapper. Infusorium is a mixture of bacteria and protozoa that is made by putting dead grass in a cup of water. Make 2 identical jars or glasses of infusorium. Zap one several times a day, but leave the other one alone. The zapped infusorium will remain relatively clear while the unzapped infusorium will turn cloudy with bacteria and other germs. It is odd, but I have reviewed several text books on biology and microbiology and have yet to find a single mention of using electricity to control bacteria, protozoa, or other organisms. 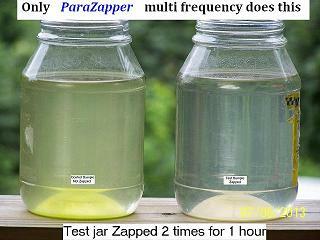 Note: Not all zappers are the same and this is only valid for ParaZapper Multi-frequency zappers. If it can do this with water, why could it not do the same with other water based systems such as the human body? Time for more studies? Are you interested in researching this amazing gift? Video showing how the use of frequencies can kill microbes and cancer cells as well. The Zapper is also an ideal candidate to use to treat antibiotic resistant infections such as MRSA, Clostridium difficle, and flesh eating bacteria. The medical profession, sad as it is, would rather let these patients die than to admit the error of their past judgments and try electricity for healing. This is despite the fact that zapper like devices have existed since the 1800's. These Medical Electric Batteries were available in stores everywhere, including Sears, Montgomery Wards, and drug stores. So, other than the lack of peer reviewed studies, is there any real evidence that zappers can or do work? A A new pulsed electric field therapy for melanoma disrupts the tumor’s blood supply and causes complete remission without recurrence The application of 300 high-voltage (40 kV/cm), ultrashort (300 nsec) electrical pulses to murine melanomas in vivo triggers both necrosis and apoptosis, resulting in complete tumor remission within an average of 47 days in the 17 animals treated. None of these melanomas recurred during a 4-month period after the initial melanoma had disappeared. In 2012, Tumor treatment fields have already been approved by FDA to use for patients with recurring glioblastoma. According to Maciej Mrugala, M.D., Neurocologist at the University of Washington, "Tumor treating fields are really a very novel approach to treating cancer, not only glioblastoma. It’s a method that utilizes electrical field as a way to arrest cells in divisions leading to shrinkage of the tumor, thru cell apatosis, (cell death)". He states "Electrical fields have been known and used in medicine for quite a while now and their biological activity is heavily dependent on the frequency. ... finally you have this intermediate frequency fields, typically between one hundred and three hundred kilohertz. These fields have been found to have inhibitory effects on dividing cells." New peer reviewed study just released in a scientific publication shows efficacy of MORA Bio-resonance Therapy combined with a Zapper. Study results show that the addition of the zapper produced a statistical increase in efficacy in reduction of allergies, infections, and pain over the use of MORA alone.The study used a 30 kHz square wave at 9 volts output and can be seen at www.sciencedirect.com and was published in European Journal of Integrative Medicine 3 (2011) e237–e244. In a published trial study, Dr. Robert Thiel found that 97 % of participants reported improvement within 45 days, while the control group total with any improvement was 61.3%. (ANMA Monitor 2(4):5-9.1998). Additionally, in this same study, the test group that used the zapper, 48.2% reported substantial symptomatic improvement, while of the control group only 12.9% reported significant improvement. It would seem that such an obvious disparity and show of significant effectiveness would get the interest of a lot of doctors and open up new studies. It is easy to see that this one basic study points to a strong potential for the cheapest most basic zapper to produce good results in health improvements. Where, then, are the follow-up studies? Why did other health professionals not follow pursuit? Why are people allowed to die of Ebola, Marburg, Hanta, MRSA, Malaria, and many other diseases that the zapper has potential to be effective against. There have been millions of zappers sold on the black market for personal use and not one single death or significant injury from the use of all of these zappers. This study was not official but was a self reporting study in which each of the participants reported their results. In his efforts to improve zappers and zapping, the author, David Etheredge, discovered some changes that can significantly improve effectiveness of the zapper. The first was the addition of a constant current device to the output rather than a fixed resistor. This improvement allows the zapper output to automatically adjust to the skin resistance. A second improvement was the addition of "Augmentation Footpads" which is the combimed use of both hand holds and also pads under the feet at the same time, creating a 4 point contact system that allows the zapper signal to be distributed all over the body rather than just from one hand to the other. In this setup, three points are positive and one point is negative, because it is the positive pulses that are active. This combination can double effectiveness in some cases but it requires a zapper that is strong enough to support it such as is found in zappers with current control output. Every page that you visit that has comments against the zapper point to one particular incident that occurred with a very antiquated pacemaker that failed after the use of a zapper. What is the truth about the individual who used the zapper with a pacemaker? The individual had cancer and had been warned that the zapper, just like any other electronic device that touches the body, could damage or interfere with the pacemaker. Folks, this is a common well known problem with pacemakers. While the anti-Clark activists use this to demonize Dr. Clark, it is not the fault of either the zapper or Dr. Hulda Clark. In case you were interested, the man survived the failure of his pacemaker and his cancer went into remission according to public information. In the many years since Dr. Clark introduced the zapper, many entrepreneurs and developers have worked on and studied zappers and their effects on many things. Along the way, there have been a number of discoveries. First, although Dr. Clark recommended 30 kHz for zapping, there are a number other frequencies that produce better results in various situations. Some such as the Don Croft Terminator, which runs at about 15 Hz ( close to twice the Schumann Earth resonance frequency), helps with a number of things such as mood and sleeping. Others found that a frequency near 2500 Hz had a stronger effect on some viral threats. It was also found that using several frequencies could have some additional benefit as it appears that there actually is not just a one fits all situation, although Dr. Clark claimed that "any frequency between 10 Hz and 500,000 Hz" will work for zapping. Some frequencies are just better at some things than others are. There were a number of investigators that actually preceded Dr. Clark by many years and one of these, Dr. Royal Raymond Rife, determined that each organism had its own specific Mortal Oscillatory Resonance ( MOR ) and that the right frequency could be used to kill those organisms, just as the voice of Ella Fitzgerald could shatter a wine glass. While initially hailed as a hero, Rife had his lifes work destroyed and was blackballed and demonized by the medical community for the sake of more profitable prescription drugs. So, if Rife had determined that each microbe had its own MOR, how could Dr. Hulda Clark's zapper work? The zapper produces a special output waveform, called a square wave, that contains the odd harmonics of the fundemental or base frequency of the zapper. As an example, many bacteria and viruses are affected by frequencies of 300 kHz to 450 kHz. Protozoa, roundworms and flatworms are affected by frequencies between 350 kHz and 500 kHz. Molds appear to be affected by lower frequencies of around 80 kHz to 220 kHz. So, if the zapper frequency is 30 kHz, then the odd harmonics would be 90 kHs, 150 kHz, 210 kHz, 270 kHz, 330 kHz, 390 kHz, 450 kHz, 610 kHz, etc. These numbers would naturally be close to any number of MOR frequencies of various organisms. So, a zapper at 30 Khz would be effective against some, but not all microbes of interest. Hence, we see that a certain percentage of many different infections are affected, but not all. There is also one overlooked problem with the zapper. The circuitry used to build many older type zappers, such as ParaZapper ™ STD, or the Ultimate Zapper is just a crude timing circuit with poor accuracy. The Ultimate zapper provides 2500 Hz and the ParaZapper ™ STD does too. The frequency, while specified as 30,000 Hz can be as low as 27,000 Hz or as high as 33,000 Hz, using quality components and even worse using standard hobby level components. The same is true at 2500 Hz, as it can be from 2250 to 2750 Hz with quality components. As a result of this, one zapper might work exceedingly well for a certain microbe but another of the same or different brand may not work so well, even if made of the same components. The end result is that while zappers of the original design can and do work, they just are not consistent. This has been a complaint about zappers for many years, inconsistent results. As an effort to get around this problem zapper makers have tried many techniques. One, Ken Presner, used an uneven duty cycle in the Ultimate Zapper, as an effort to generate a greater number of harmonics. The problem was that the added harmonics were not as strong and in some cases could actually detract from the important frequencies. Others developed a scheme called quad harmonics which allowed the zapper to produce several frequencies at the same time, combine them, and thereby produce even more harmonics. This was a good plan, but the problem of inconsistency and inaccuracy were still a consideration. The latest steps forward have been achieved through the use of microprocessors which are able to produce a more exact base reference frequency as well as multiple frequencies in sequence or at the same time if needed. There are several options for generating accurate and reproducible frequencies so that if one zapper of a specific type works well for a particular problem or issue, then all or nearly all of the units of that same model should be able to produce the same results. As additional information, the following table was compiled from a ParaZapper customer survey that was done in 2006, about the time that ParaZapper was raided by the FDA. As a note: What did Dr. Robert Thiel get for his landmark study? Harassed, hounded, criticized, and defamed. This page is published by me: David Etheredge who was raided by the FDA in 2006 for his efforts to promote the zapper. Please review and sign this Petition to stop the FDA from interfering with zapper availability. See this page for More information about Dr. Clark and quack sites. The CC2 zapper,MY-3 zapper,6-Pack zapper, and the UZI-3 zapper are available from ParaZapper.